It’s a little difficult to explain, so I’ve included a “Drill Diagram” as I like to call it! And as always, I encourage you to take this drill and make it your own. It is designed for a team running a 6-2 (two setters used in a match, typically decided by front row/back row rotations). The coach will stand opposite of their team with a ball cart (it’s better to hit towards a wall or a net if possible, so you might need to switch sides from where your bench is. You don’t want to hit towards a crowd of parents and siblings). Players will get in line to hit or pass, depending on their primary responsibilities. You can have defensive specialists also pass and rotate with liberos if they do not need to practice front row. As you can see in Round 1 and Round 2 from the Drill Diagram, there is also a setter in the normal “setter position” aka right front, and there is another setter in the middle of the court, slightly towards outside. The reason we do this is to increase the number of touches on the ball everyone gets, while ensuring our setters do not get ran over by our middles. Running the drill is fairly simple, the only difficult might come from bad passes. However, you can get your team warmed up by starting with freeballs to the liberos/back row players, and work your way into more aggressive downballs. More experienced teams can even enter the ball (instead of the coach) if they have the focus and maturity to do so. Coach tosses to L1, L1 passes to S1, S1 sets to the Outside Hitter, Outside Hitter progressively starts swinging harder as their muscles warm up. The coach THEN tosses to L2, L2 passes to S2, S2 sets to either the Right Side or Middle Front, and these players progressively start swinging harder. To make this go faster, you do not need to wait for the first ball to be hit over. You simply wait until it is safe and toss the next ball to the opposite libero. *Safety warning: If the set is going to the middle, wait until you know the middle hitter will not interfere with the setter standing next to them. A middle chasing after a bad set is a good way to take out two players at a time. After one minute, you will switch setter and libero positions to get to…. I have the liberos paired up with the setter they’ll primarily be passing to the most. This lets them get into a sort of rhythm before the match starts. Switch them both so now the setter who was only setting outside is not setting right side and middle front, and vice versa. Easy peasy. Run this round for a minute. Now that everyone’s fairly warmed up, we eliminate a setter and let them get into a hitting line. This gives our setters the chance to practice pushing the ball to the outside, and our outsides now get a read off a true outside set. You’ll still alternate tosses between liberos, but now you must wait until there’s a dead ball and your setter is ready to go before tossing again. Switch setters and repeat :) Also, move the liberos to match up with who would be passing from left back (where I put my liberos) to the particular setter). Switching liberos isn’t necessary, but I prefer to do it. 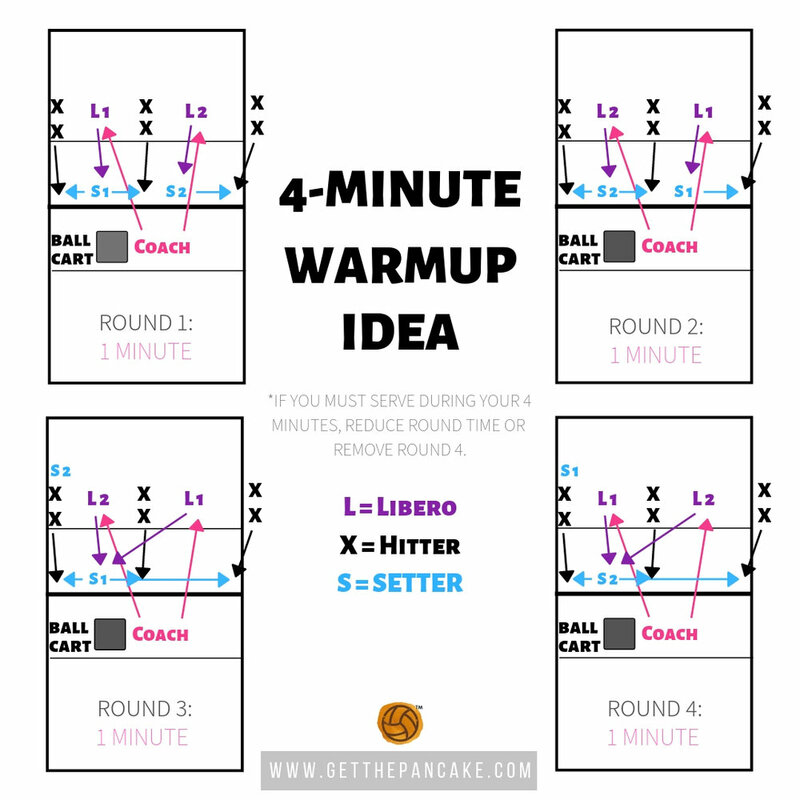 Scenario: You only get 4 minutes TOTAL of court time, meaning you must also warm up serving during the 4 minutes. Solution #1: Run through each round for 45 seconds. This will put you at three minutes, with one remaining for serving. This works nicely because you’ll get a one minute warning from the officiating crew. I HIGHLY suggest you practice the warm up so you know how to transition quickly and make the best use of your time on the court. Solution #2: Only do rounds 1-3. Sure, your second setter misses out on setting outside, but you could get some setting reps in beforehand for your early matches and later in the day this won’t be as crucial. 1 minute each at Rounds 1, 2, and 3, then you get your one minute for serving. I know, I’m a math genius. Let me know in the comments (or on the Get The Pancake Facebook page!) how this works out for you!